Kids Gift Ideas: 20 Beloved Toys That Stand The Test of Time - Lovely Etc. 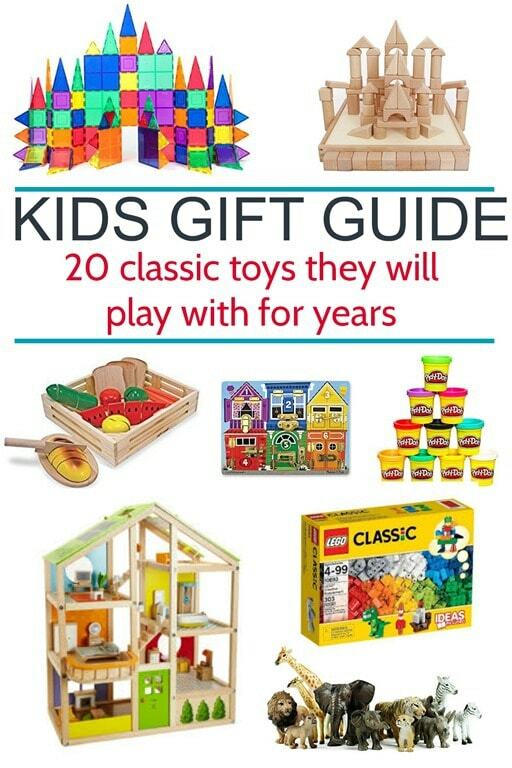 If you are looking for kids gift ideas, this list of classic toys truly stand the test of time. They are a hit with all ages, encourage imagination, and kids love them. I love to buy my kids toys at Christmas. Even though they surely have more toys than they could ever need and I actually just cleared out a huge boxful of toys that nobody has played with in months, I still love that joyful moment when they unwrap a fun toy and their little faces light up. It’s the best. I know the trendy thing to do now is give experience gifts instead of stuff, but my kids are still young enough that they really just don’t understand the idea of an experience gift. They want something the can unwrap and immediately play with. The problem is that not all toys are created equal. There are wonderful toys out there that stand the test of time and can hold kids’ attention for hours. And there are other toys that are incredibly fun for about five minutes and then end up in a big pile of other abandoned toys in the floor. The last thing any of us want to do is just create more toy clutter whether we are buying gifts for our own kids, our grandkids, or someone else we want to bless. So before I head out Christmas shopping or tell the grandparents what my kids want, I wanted to take a minute and really think about what toys have stood the test of time. These are the things my kids come back to over and over again and play with for hours. And since my oldest is only six, I also conferred with friends who have older kids to get their input on what toys their kids continue to love for years. These are the keepers. Also, everything on this list is great for boys or girls. Since most of these toys are open-ended, kids can play with them any way they choose and there is absolutely no reason a little girl can’t play with trains or a little boy can’t pretend to cook. So if you are looking for an awesome gift idea for a kid in your life, this list is an awesome place to start. Legos. My older two boys absolutely love Legos and Duplos. I know a lot of kids love to get specific Lego sets, but I think it works best to have at least one set of basic bricks as well. Then you can mix and match them with sets or use them on your own and truly build anything, not just what’s pictured on the box. My three and six year olds both love to play with Duplo blocks which are a bit larger and easier for small kids to put together and take apart. My six year old is just starting to love regular Legos as well and I foresee many years of playing with them ahead. I mean, I’m 36 and I still love playing with Legos! I don’t really recommend the Mega Bloks that are for babies and toddlers. They seem like a great idea, but by the time kids are old enough to actually build things, they are old enough to handle Duplos, which stay together much better. Magnetic Blocks. These are the number one toy in our household. If we lost everything and were only allowed to replace one toy, I would buy more Magnetic blocks in a heartbeat. They are easier for young children to put together than Legos, they clean up quickly since they all stick together, and everyone loves playing with them. 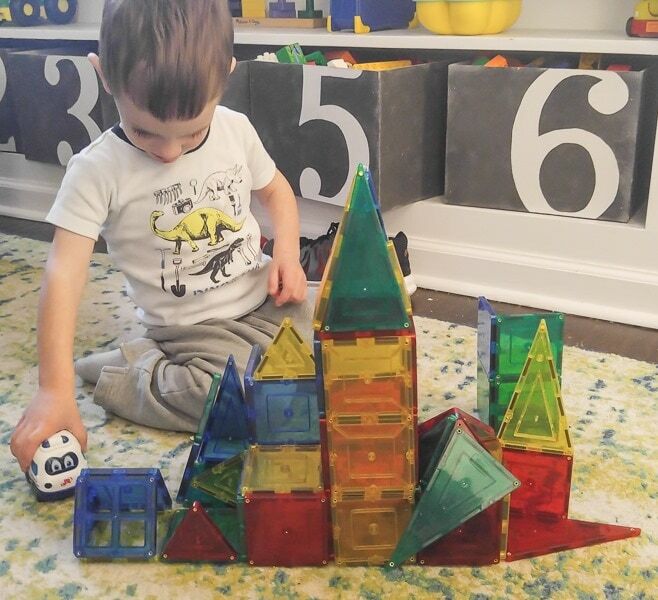 Magnatiles are the name brand version and Magformers are also popular. We have this very inexpensive version from Amazon and they have worked great for us. I can’t say for sure that Magnatiles aren’t better since we don’t own them, but I can say that even the cheapies have held up well for over a year of daily use. Even my 16 month old loves to stack them up. Wooden Blocks. These are such a classic toy. As a child, we had a big sack of these at my grandparents’ house and I played with them every time we went there. Now my kids love to play with them as well. Wooden blocks are harder for small children to build with than legos and magnetic blocks but they are awesome because they are so completely open ended. They can truly be anything. That being said, if you don’t want to have so many different types of blocks, I would recommend Legos and Magnetic blocks over wooden blocks. They are just easier for kids to build with and typically get played with more. Plastic animals and dinosaurs. My boys love playing with plastic animals. Dinosaurs are their favorites, but they love any animals. Their animals act out stories, they have races, they become families, they do all kinds of imaginative things. Hot wheels. Hot wheels and other die cast cars are small enough to go anywhere and they are sturdy enough to stand up to lots of play. Hot Wheels tracks and ramps are fun, but they get very repetitive, they take up a lot of space, and many kids lose interest pretty quickly. But the cars themselves are perfect. They are easy to store and all you really need to play with them is a smooth surface. Puzzles. Puzzles really engage kids’ brains in a different way than many other toys. Simple wooden puzzles are great for toddlers and larger jigsaw puzzles are perfect as your kids get older. My favorites are Melissa and Doug puzzles – they feature classic designs instead of trendy characters and they are very sturdy. This latch board is also one of our favorites. Art supplies. Art supplies can include so many things – crayons, markers, watercolors, pipe cleaners, pompoms, feathers, paper, glue sticks, scissors, tape. Art supplies are the ultimate open-ended toy; it is amazing what kids can create with just a few basic supplies. If you want to keep it simple, this art kit looks like a lot of fun. Cute craft kits and coloring books can also be good, but they are more hit or miss because it all depends on whether or not the kid likes that particular craft or those particular characters. But basic art supplies are always a good thing. Play kitchen and play food. 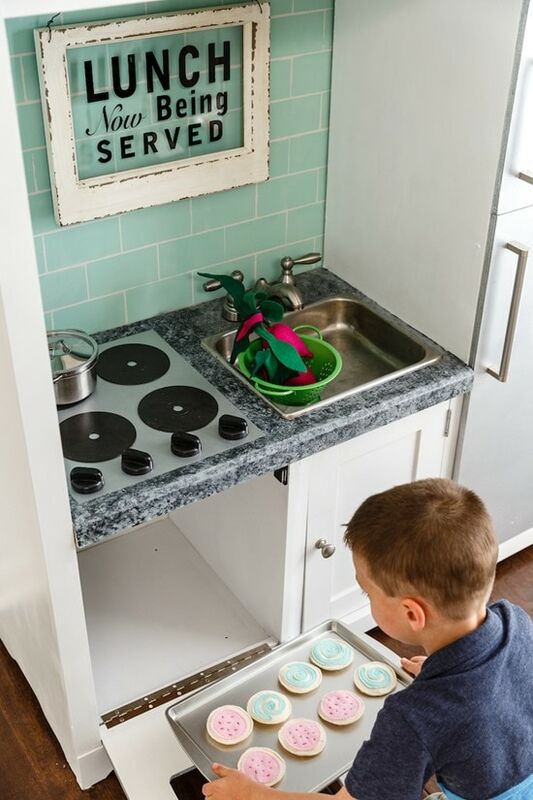 I made my kid’s play kitchen out of an old entertainment center but there are also some really great ones that you can buy. When it comes to accessories, we love these realistic looking pots and pans. We have felt play food, wooden play food, and plastic play food and my kids love it all. Some of the plastic food doesn’t last as long because it is usually hollow and eventually gets smushed, but my kids still love it. Their favorite play food set is this fruits and vegetables set that can be ‘cut’ with the wooden knives. Dress up clothes. All of my kids love to dress up. You can buy sets of dress up clothes, but you can also typically find lots of great dress up items at thrift stores and yard sales. Some of the favorites at our house are capes, masks, hats, and other accessories that can be mixed and matched to make new characters. We also throw a lot of our old Halloween costumes in the dress up clothes basket. Play doh. Play doh can be a little messy, but my kids adore it. They love the idea that they can create absolutely anything they can imagine. There are tons of Play doh toys out there, but all you really need are a few different colors of Play doh and a basic kit of tools including rollers and cutters. A doctor’s kit. Kids love to act out things they see happening in the real world, including going to the doctor. My kids love to give each other check ups and of course, shots. Doctor’s kits are also good to have on hand if your kids are ever scared to go to the doctor so you can role play before hand. If you are looking for ideas for Christmas gifts, it may seem strange to consider outdoor toys. In a lot of places, kids won’t be playing outdoors for several months. But for most of us, it will eventually be nice again and we will be ready for our kids to get outside and out of our hair. These toys are the perfect thing to keep them occupied for hours. If you are buying one of these toys as a gift for someone, be sure to consider whether they have space for something large like a water table or sandbox and whether they have a good place to ride a scooter or bike. Water table. 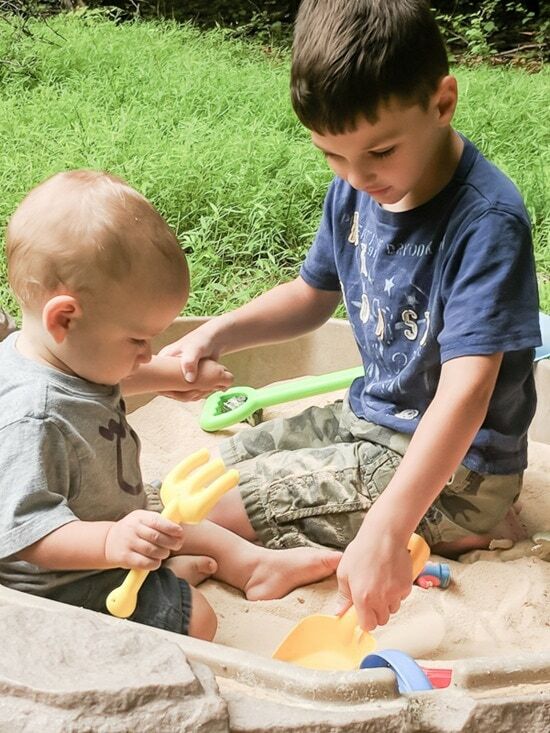 I know that eventually my boys will outgrow the water table, but I had to include it. They have all loved playing with the water table from the moment they were old enough to pull up to standing. You can buy fun water toys to use, but my kids also really love just playing with plastic cups and funnels at the water table. There is something about pouring water that is immensely soothing to even adult brains so this is the perfect toy to help calm down an overly energetic child. Sand box. This is another one that definitely works for kids of all ages. My baby loves to simply run his fingers through the sand and throw it in the air. Older kids can play with trucks, pretend to have archaeological digs, and act out pretend action moves. Scooters and Bikes. Scooters and bikes are always a classic. Balance bikes are great for small kids who haven’t quite learned to ride a bike yet; kids who start with a balance bike tend to pick up bike riding much faster than others. We don’t have sidewalks or a paved driveway, which makes it hard for my kids to ride their scooters at home, but they still love to play with them when we go to the park. Bubbles. Everybody loves bubbles. They are cheap, they are small, and they are easy to take on the go to the park or to a friend’s house. Sidewalk chalk. Draw pictures, play hopscotch, trace your body, draw a target to throw things at; there are so many possibilites. And again, cheap and transportable. There were a few toys that I think are awesome and recommend but with reservations. These are toys that I think are amazing for some kids but may be a miss for others. Two of these are pretty large and could end up becoming major clutter for kids that don’t love them and two are fabulous toys for small children but are outgrown after only a year or two. Wooden trains and train tracks. I debated leaving trains and train tracks off the list completely. Little train sets are a fun toy for lots of kids, especially if they like to design their own tracks and a lot of kids, including mine, absolutely love their trains. The downside is that it can be a lot of stuff to store. Some people get a big train table to keep everything close at hand and ready to play with, but that can take up a ton of room. And if you don’t have a train table or a big open space, there is a good chance your train tracks may end up spending more time in a box than actually being played with. If you aren’t sure how much your child is going to love trains, you can always buy a smaller set of train tracks and just a couple of trains. For a long time, all we owned was a little loop track and two trains and my boys loved it. Dollhouse and accessories. Dollhouses can be as realistic and detailed or as plain and simple as you want. My kids have a plain plastic castle dollhouse with absolutely no furniture or accessories and they love playing with it. I’ve been thinking about upgrading their dollhouse to this cute wooden one and getting a few pieces of furniture for it, but we’ll see. They honestly don’t seem to care about furniture – they just want somewhere to play pretend with their plastic animals and people. This one is in the maybe category because it is such a big toy and it isn’t an absolute must. Cozy Coupe. I’m sure we’ve all seen the classic cozy coupe. It’s a classic for a reason – kids love being in small spaces that are just their size and they love imitating the things their parents do everyday like driving. We have an old Cozy Coupe Station Wagon and my kids adore it. The only big downside is that a cozy coupe really only lasts for a few years of play because kids simply get too big for it. This is a great toy to buy used and then pass on to another family when you are finished. Nesting and Stacking Blocks. I bought these on a whim and I was shocked at how much all three of my kids love them. They love to make towers with them and knock them down, use them as containers to put other toys in, or simply nest them together. The only reason these don’t get a whole-hearted recommendation is I think they definitely work best for younger kids so they won’t be played with as long as many of the other toys on the list. Those are my top picks for classic toys that will be loved for years. Hopefully this will make your Christmas shopping a little easier this year!